Dr. Takashima is the founder of the Parkway Veterinary Hospital, a small animal practice that as of 10/1/2014, joined the Animal Care Group of Lake Oswego (ACGLO), which is a collaboration of several veterinary services providing Cardiology, Orthopedic surgery, Physical rehabilitation, Emergency, and Mobile & Hospice care, along with general medicine. ACGLO is comprised of 9 general practice veterinarians, 1 cardiologist, 1 orthopedic surgeon, 3 ER specialists, 1 rehab specialist, and a support staff of~55. 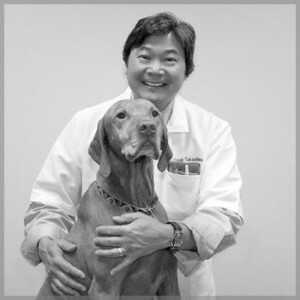 A frequent participant in organized medicine, Dr. Takashima especially believes that creating a culture within the veterinary practice and profession that nurtures and embraces the Human-Animal Bond through the practice of veterinary excellence and compassion; will benefit human, animal and environmental health.